Sloto Cash continues to give players the chance to enjoy the most amazing and exciting slot machine games on the net. Play our newest video slot The Three Stooges: Brideless Groom and claim a magnificent 100% Match plus 33 free spins to create even more winning combinations! 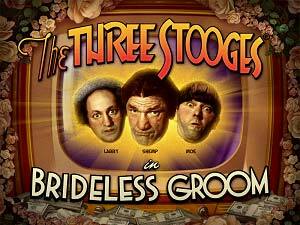 The Three Stooges: Brideless Groom is a fantastic 33 payline slot game that will grant you tons of winnings with your favorite bonus features such as free spins, multipliers and Whacky Wilds! The Wild symbol in this game is the Three Stooges image and it will trigger a re-spins feature when it makes an appearance on the middle reel. 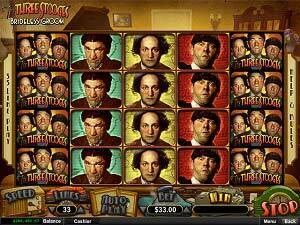 When the wild appears on reels 2, 3 or 4 you will get to play the Stooge Picks feature. In this bonus game you’ll need to find two pieces of a broken heart to collect either free spins, Whacky Wilds or increased bet multipliers. To top it off, The Three Stooges: Brideless Groom gives you more winning chances when you put in motion the Lucky Stooge bonus feature where you can win up to 33 free spins that will be randomly awarded at the end of any spin. More fun and winnings are waiting for you when you play our newest slot and collect a 100% Match + 33 Free Spins!